Pervasive climate-based heat affects all corners of the globe, even places that normally have hot, tropical climates. One place already experiencing some of the devastating effects of rising temperatures and heatwaves is South Asia. The region’s rapid urbanisation and poverty rates are among the most important factors when it comes to heat, and general climate, vulnerability. However, solutions like green and reflective roofs are emerging as heat adaptation measures. South Asia is already a hot and humid region and it’s getting even hotter. The average temperature there is rapidly approaching 37° C, which is the operating temperature of the human body. When the apparent temperature approaches body temperature, the body’s capacity to function properly is greatly diminished. This type of heat-stress leads to heat-related illnesses such as heat-stroke, exhaustion, and dehydration. In the Ganga Plains, there are regularly days where the temperature exceeds 37° C, which puts residents highly at risk for heat-related illness. Climate projections for this area suggest that by 2050 there will be 152 out of 200 days between April and October where temperatures exceed 37° C. Because of these extended periods of extreme heat, the residents of the Ganga Plains will experience even more heat-related illnesses. Millions of families in rural South Asia depend on livelihoods that expose them to extreme heat, such as farming. These families are usually low-income and do not have access to cooling systems that offer relief from the heat. Extended periods of manual labor in the heat make farmers and other manual laborers distinctly vulnerable to heat-related illnesses. The heat also decreases agricultural productivity because the heat harms crops and livestock. For example, Terai, Nepal’s most productive agricultural region, is in jeopardy because projections show temperatures increasing by 2.8° C by 2060. This heat will likely reduce the arability of the land, limit water for irrigation, and pose a deadly threat to the farmers’ health. The Urban Heat Island effect caused by the rapid urbanization and population growth in South Asia is adding heat to the already warming climate. Urbanization modifies land cover and replaces natural heat sinks, such as trees, lakes, and wetlands, with pavement and buildings that absorb a lot more heat. Because of this phenomenon urban areas in South Asia are significantly warmer than their rural counterparts. This phenomenon is even present in typically cooler hill cities such as Kathmandu. As of 2016, a study estimated that the Kathmandu’s average heat index per month is 20 percent higher than that of each corresponding month 30 years ago. Currently, Kathmandu’s metropolitan center is 1° C warmer than the outskirts. The increased heat makes city residents vulnerable to heat-related illnesses and exposes them to respiratory harm from the high concentrations of air pollutants that usually accompany urban heat islands. To cope with the heat, South Asian communities use a variety of cooling techniques. The most popular technique is to install reflective material or vegetation on roofs to minimize heat absorption. Reflective roofs are especially critical in combating heat in urban areas where roofs make up the majority of surfaces hit by solar radiation. In Pakistan, a National Center for Atmospheric Research and Institute for Social and Environmental Transition study found that at night houses with reflective roofs were 3° C cooler inside than outside. Furthermore, in Bangladesh reflective roofs have been shown to reduce the indoor heat index by 77 percent during peak heat times. South Asia’s overall ability to limit heat stress depends on reliable delivery of basic services such as clean water, sanitation, healthcare, and energy to run cooling technology. These services will help communities stay cool and treat heat-related illnesses. However, to provide these services, there must be significant investment in infrastructure. South Asian governments must also implement policy measures to preserve natural heat sinks, such as parks and lakes, and limit human activities that contribute to climate change, in order to brace for rising temperatures. Cover photo by Barun Khanal/Wikimedia (CC BY-SA 3.0): Aerial view of field in the Madhesh region of Nepal. In late June the Iranian city of Ahwaz, home to over 1 million people, registered scorching 53.7°C. This falls short of the hottest temperatures to ever be reliably measured by just 0.3°C. Météo France meteorologist Etienne Kapikian reported the temperature on 29 June. However, hours later, the website Weather Underground reported 54°C air temperature, tying it with two heat records measured in Kuwait in 2016 and Death Valley in 2013, if verified. Verified or not, we can probably all agree that temperatures above 40 and, even worse, 50 degrees are unbearable. However, air temperature, which is what thermometers usually measure, is only one part of the equation. In order to calculate the “felt air temperature” or Heat Index, relative humidity needs to be considered as well. Taking into account the 17% relative humidity measured in Ahwaz on 29 June, the “felt air temperature” that day was a staggering 61°C. To put that into perspective: Egg whites cook at 65°C. The heat index was developed because relative humidity affects how the body cools itself. The human body cools down by sweating. As the sweat evaporates, heat is removed from our bodies. If there is high relative humidity, however, the sweat cannot evaporate anymore leading to a sense of overheating. The degree to which this affects people often depends on their physical disposition like e.g. being pregnant or having metabolic differences. Thus, the index contains many assumptions that might not apply to everyone. Most importantly, however, the Heat Index is based on temperatures in the shade, meaning that actual conditions, especially when being exposed to direct sunlight can be even worse than the index states. One can only guess what this meant for the people of Ahwaz in late June this year. The high temperatures of Ahwaz come just a month after several places in the Middle East experienced their highest temperatures ever recorded. A bit further, the Pakistani town of Turbat recorded 53.5°C on 28 May, a world record for the month. All of these readings are consistent with scientists’ expectations of extreme temperatures in a warming world. A 2016 report by the National Academy of Sciences stated that hotter and more frequent heatwaves are among the weather events that are most easily connected to human-made climate change. A study published in late 2015 found that future heatwaves in the Gulf might push the region’s temperatures beyond anything humans can adapt to or endure. They likened the future climate of certain Middle Eastern regions to that current one of Northern Afar, Africa, which has no human settlements and an average annual temperature of 34.4°C. Apart from reducing carbon emissions in order to avoid even worse climate impacts, it is hard to imagine adaptation strategies that would effectively protect people in such extreme heatwaves. While wealthier states might be able to afford protecting people indoors with air conditioning, countries like Yemen, which relies heavily on aid from multilateral agencies, would surely suffer. Especially children and the elderly would disproportionately be affected by premature deaths due to heat. Since extremely dangerous temperatures are already being observed, it will be of utmost importance for affected countries and the international community to work on solutions that will protect at risk populations. Cover photo from Pixabay (public domain). With droughts set to become more frequent due to global warming, delivering timely, long-term weather forecasts to farmers in the developing world will be key to limiting damage and saving lives, the head of the U.N. food agency said on Monday. Droughts have killed more than 11 million people worldwide since 1900 and now affect double the land area than in 1970, according to the U.N. Food and Agriculture Organization (FAO). Developing countries are the most exposed, with their agricultural sectors shouldering 80 percent of all damage caused by drought, FAO says. Better access to reliable weather data and early warning systems could help farmers in rural areas get ready to endure long spells of no rain, said FAO director-general Jose Graziano da Silva. “Most of the times poor rural communities in developing countries don’t even know that a drought is about to strike,” he told a conference at the FAO headquarters in Rome. Measures such as planting resistant crops and building water reservoirs can greatly reduce the impact of droughts, but international responses too often focus on emergency relief, said Graziano da Silva. “People die because they are not prepared to face the impacts of the drought – because their livelihoods are not resilient enough,” he said. In Rome, FAO and the World Meteorological Organization (WMO) signed an accord to increase cooperation in the face of climate change, improving agro-meteorological services to help small farmers prepare for droughts. WMO secretary general Petteri Taalas said weather forecast accuracy had greatly increased in recent years thanks developments in satellite, computing and scientific research. “Weather forecasts are not anymore a joke, they are something you can very much rely on,” he told the conference. Know-how related to long-term forecasts and prediction of major climate events like El Niño had to be shared between rich and poor countries, he added. The last El Niño, a warming of ocean surface temperatures in the eastern and central Pacific that typically occurs every few years, subsided in 2016 and was linked to crop damage, fires, and flash floods. Deadly heat stress is projected to affect hundreds of millions more people each year under relatively little additional climate warming. The Paris Agreement commits the international community to limit global warming to no more than 2℃ above pre-industrial (late 19th century) air temperatures, with an aspirational target of 1.5℃. In our latest research, which looked at the impact of global temperature rises on megacities, we found that even if 1.5℃ is achieved, large increases in the frequency of deadly heat are expected. By 2050 about 350m more people living in megacities could be exposed to deadly heat each year. Humans become “heat stressed” when the body absorbs more heat than is tolerable. If core body temperature rises just a few degrees above 37℃, deadly heatstroke can result. By using its cooling system – sweating – the human body can maintain a safe temperature even if air temperatures rise above 37℃. This mechanism works better in a drier atmosphere (which is why steam rooms feel hotter than saunas – even at the same air temperature). The heat index is a measure that combines this humidity effect with air temperature to provide a “feels like” temperature. A heat index in excess of about 40.6℃ is considered dangerous to human health. This non-linear response carries over to the definition of “global heat stress burden” used in our research, which we define as the average number of days per year over land areas with a daily heat index above 40.6℃. Using a large number of climate model simulations, we found that this quantity increases faster and faster as global average air temperatures rise. This sharp rise in global heat stress burden has important consequences. Second, there may be progressively heavier global impacts if the Paris targets are breached. Our analysis suggests that for 1.5℃ warming, the global heat stress burden will be almost six times greater than experienced during 1979-2005. But heat stress is 12 times greater if warming reaches 2℃. With 4℃ warming – which could happen if mitigation efforts fail – our analysis suggests that the global heat stress burden could be more than 75 times larger. For example, in 2015, Karachi and Kolkata in India experienced lethal temperatures. Our analysis suggests that in a 2℃-warmer world, both cities could experience these deadly conditions at least once a year. If global warming reaches 4℃, the record heat of 2015 would be commonplace – more than 40 days a year. Other regions would not be immune. With only 1.5℃ of warming, twice as many global megacities (cities with a population greater than 10m, including Lagos, Nigeria, and Shanghai, China) could start to regularly experience heat stress. At 2℃, Tokyo (the world’s most populous city), may be affected. New York City joins the list at 4℃. Heat stress sensitivity to global temperature rise and the potential human impacts – even at 1.5℃ above pre-industrial levels – provide a strong incentive for limiting global warming. Warming associated with the Paris targets may sound modest enough for the urgency of the situation to be lost. Our analysis shows that even if ambitious mitigation targets are met, the need to adapt to extreme heat will remain. The high concentration of people and heat in urban environments make cities an important focus for these adaptation efforts. Tom Matthews, Lecturer in Physical Geography, Liverpool John Moores University. This article was originally published on The Conversation. Read the original article. While most Americans recognise that climate change is a real threat, the pervasive attitude is that it is a distant problem. Although, people might be concerned for the future of the ice caps and coastal cities, many have not considered the possibility that climate change could affect their lives and health right now. The Medical Society Consortium on Climate and Health (MSCCH) seeks to remedy this and alert Americans that climate change is already harming their health. In March of 2017, the MSCCH released a report that outlines the ways climate change threatens our health. Through scientific studies, facts, and anecdotes, the physicians expose the health consequences of climate change. They paint a grim picture of a society plagued by climate-related illnesses explaining how the increased frequency of extreme weather events will impact our health. Heat waves will cause more incidents of heat-related illness and stress, which are already the leading cause of climate-related deaths. Severe storms and flooding will cause displacement, injury, death, and even contaminate drinking water and crops with debris and pollutants. The report also describes how a warmer and wetter climate allows disease vector species such as ticks and mosquitoes to thrive and expand their geographic range, which alters the pattern of infectious diseases. Physicians are already seeing an increase in cases of Lyme Disease and West Nile virus, and fear that malaria might reemerge in the United States. As these carriers spread throughout the United States, they will bring familiar diseases to new places, and allow for the rise of new ones. The physicians present poor air quality as the most widespread and pressing threat to our health. The emission of greenhouse gasses and particulate matter, combined with frequent wildfires, has significantly reduced air quality. People’s hearts and lungs are most at risk, but poor air quality has also been linked to cancer in other parts of the body. Approximately seven million people worldwide die prematurely every year due to health issues linked to air pollution. Furthermore, a growing body of research suggests that the physical, social, and economic stresses that climate change creates increase the risk of mental health issues. In the wake of extreme weather events, most survivors report stress, depression, and anxiety. In one case, after record flooding in Louisiana in 2016, teachers reported that some children became so anxious when it rained, that the children needed counseling. Image: The map shows key impacts of climate change on health in the USA by region. Credit: The Medical Society Consortium on Climate and Health. In the face of these alarming facts, the MSCCH has embraced a central ideal of public health: prevention. These physicians side with climate scientists and conclude that only through swift action can we prevent further harm and protect the health of all Americans. Their proposed means of prevention is to “accelerate the inevitable transition to clean, renewable energy”. This transition would have immediate public health benefits. It would move away from greenhouse gas combustion, and reduce exposure to harmful pollutants, slow warming, and clean up our air and water. Additionally, clean and renewable energy encourage active transportation, such as walking and biking, which help to lower rates of heart disease, respiratory illness, and diabetes. To achieve this transition and implement preventative and protective measures, the physicians prescribe certain actions to various demographics. First, they recommend doctors treat patients who are affected by climate-related health effects. They also implore doctors to educate their patients and the public on how climate change can affect their health, and what actions we can take to prevent further harm. Next, they advise public health professionals to educate the public on the threat climate change poses, and develop climate risk monitoring and alert systems to keep the public informed in the case of an extreme weather event. Finally, the MSCCH urges business leaders and policymakers to assess this new information and adapt accordingly so that we can build resilience against harmful effects of climate change. The MSCCH’s prioritization of prevention and mitigation reveals that adaptation and resilience carry diverse sets of benefits. Melting in the Arctic region is uncovering unwelcome waste, pollutants and diseases that were once thought to be ‘preserved for eternity’. Melting of glaciers, tundra and sea ice is taking place at a rate that is uncovering radiological waste, sewage and even Anthrax. A military camp built beneath the surface of Greenland ice sheet during the Cold War was left abandoned in 1967, leaving behind a heap of waste which included 200,000 litres of diesel fuel, 24 million litres of biological waste in the form of sewage, and radiological waste. The waste was left in the belief the snowfall would continue falling and the waste would be “preserved for eternity”. However, due to climate change, Greenland has lost 1 trillion tons of ice over the period of four years between 2011 and 2014. There is worry that the melting and the unearthing of this waste has potential to expose great amounts of hazardous materials. Arctic regions experience warming from climate change at almost twice the global average. In the northern arctic region of Russia in 2016 there was an outbreak of Anthrax, it caused the death of a 12-year-old boy and hospitalised 90 people. This episode is reported to be a result of climate change as the 10°C warmer than average temperature melted the permafrost of a previous burial site for animals that died of anthrax 70 years ago. If climate change predictions are correct and the melting of permafrost continues, we could see more cases of disease outbreaks. Infections from the 18th and 19th century could re-emerge, especially near the unknown cemeteries and burial sites where victims were buried. In Russia, the thawing of permafrost and flooding has led to greater erosion of river banks where the dead were once buried. Researchers are worried that the thawing human and animal remains may lead to the re-emergence of diseases such as Spanish flu virus, which have been found in bodies buried in mass graves in Alaska’s tundra, as well as the smallpox virus and bubonic plague buried in Siberia. Though some researchers argue that the prospect of a killer infection to appear from melting permafrost is unlikely, it does raise troubling questions about what is locked in the vast frozen landscapes of the north. Each year, 600,000 children under five years old die because of air pollution. Central heating boilers, motor vehicles and industrial facilities are all significant contributors to dirty air. The problem is costing money and lives, especially in built up areas, and it may be further compounded by climate change. Air pollution is often understood as a visible phenomenon – with dense smog engulfing urban centres. However, for the most part air pollutants do not form smog, and the tiny, makes them invisible. Vulnerable citizens, such as older people and children are extremely sensitive to air pollution and are often among its first victims. The impact of air pollution on health places a substantial economic burden on society. In developing countries, for instance, air pollution results in premature deaths in the young working age population and in Sub-Saharan Africa, annual labour income losses induced by air pollution amount to 0.61% of GDP. In developed countries, the cost of sick days and emergency care caused by air pollution is considerable. Unless action is taken to reduce air pollution, the health impacts are likely to increase in severity, as the climate warms. Warmer temperatures can lead to an intensification of particulate concentrations at ground level, especially in cities. Heat and sunlight react with chemical particles such as diesel soot and gases such as nitrogen dioxide (NO2), ozone (O3) and sulphur dioxide (SO2) in the air. This leads to the formation of ground-level ozone gas, both a harmful air pollutant and a component of smog. The expected increased number of warmer and stagnant days will facilitate the phenomenon and worsen its impact on people’s health. As ground-level ozone damages lungs and inflames airways, asthma and other respiratory diseases will likely increase. The resulting impact on people’s health is likely to be severely detrimental. In the US, it is projected that tens of thousands of additional ozone-related illnesses and premature deaths per year could occur by the 2030s. The US Environmental Protection Agency assessed that such impacts on air quality could reach US$ 13.6 billion. Low-level ozone, methane, chlorofluorocarbons and sulphur dioxide emissions are also greenhouse gases, contributing to climate change and creating a noxious self-reinforcing cycle. Breaking this cycle will require concerted policy efforts to prevent particulate pollution, especially in built up areas. The resulting health benefits will undoubtedly save lives. A changing climate not only impacts weather events and infrastructure, but also presents a major public health challenge. Whether direct or indirect, cimate change impacts can have disruptive effects for human health and wellbeing, and as future climatic trends suggest both higher average temperatures and more regular extreme events, the impacts of climate change on human health cannot be ignored. Direct health risks include weather-related morbidity, increased respiratory illness and infectious diseases, climate change has broader, indirect repercussions for health, including food insecurity and mental health. Adaptation measures must, therefore, encompass a health component; a point gaining recognition as more and more governments include it in their national strategies. A recent study reviewed 10 OECD countries’ policies in that respect and highlights their varied approaches to addressing the issue. By highlighting current gaps and suggesting possible strategies, the study provides useful insights into health adaptation to climate change. To better evaluate strategies in this area it is important to identify adaptation means for the health sector. This amounts to taking preventive measures that reduce risk exposure, prevent the onset of illnesses, reduce morbidity, and minimise climate impacts. Although adaptation is often referred to as a local strategy, national governments have a role to play through integrating health adaptation into high-level policy frameworks. Their resources and guidance can strengthen and harmonise adaptation planning and generate ripple effects at the subnational level. The research – focusing on the current health adaptation strategies of Australia, Belgium, Canada, France, Ireland, Luxembourg, New Zealand, Switzerland, the United Kingdom and the United States – examined three main dimensions of national-level health adaptation: cross-sectoral collaboration, vertical coordination, and national health adaptation planning. These categories are, however, necessarily open to interpretation: vertical coordination can,for instance, be put into place differently across countries, such as through working groups, networks, partnerships, or consultation. National strategies remain broad, with 50% of surveyed countries addressing general health risks, infectious diseases, as well as heat-related risks. The ‘general’ character of these stategies suggests that national initiatives are intended to set the framework for more specific local actions. Whilst population-level health programmes, such as protecting people from heatwaves, generally emanate from national governments, interventions that address locally manifest issues, such as flood mitigation, are often conducted at a regional level. Almost two thirds (62%) of reviewed initiatives are ‘groundwork actions’, compared to 38% of adaptation actions. Among the latter, a combination of five adaptation types are being implemented, typically in the following order: capacity building, information, management, planning and policy, information, and practice and behaviour. Intersectoral adaptation planning is a common feature across the surveyed countries. Most of the initiatives are designed and implemented by national public health agencies in partnership with other bodies, with some actions co-implemented with organisations outside of health sector. This is the case in France, where four health agencies and the Research Institute for Exploitation of the Sea monitor vectors and host reservoirs. Whilst health is an integrated part of most countries’ national adaptation frameworks (with the exception of Ireland), they exhibit varying levels of detail. Whereas Australia’s adaptation plan provides general adaptation objectives, Switzerland’s plan further outlines responsible agencies and financing for each intervention. The study’s results present a picture of uneven interpretations of – and approaches to – health adaptation across the 10 countries studied. Their disparate state structures and degrees of centralisation might account for some of these differences, however, rendering it problematic to identify any single benchmark approach. Drawing-out the similarities and differences between OECD countries in health adaptation planning shows that the issue is widely acknowledged by governments, even if they address it in a plurality of ways. Identifying best practices – referenced to climatic contexts and trends, governmental strutures, and risk and vulnerabilities – and bridging gaps are essential for devising coherent and effective health adaptation frameworks. 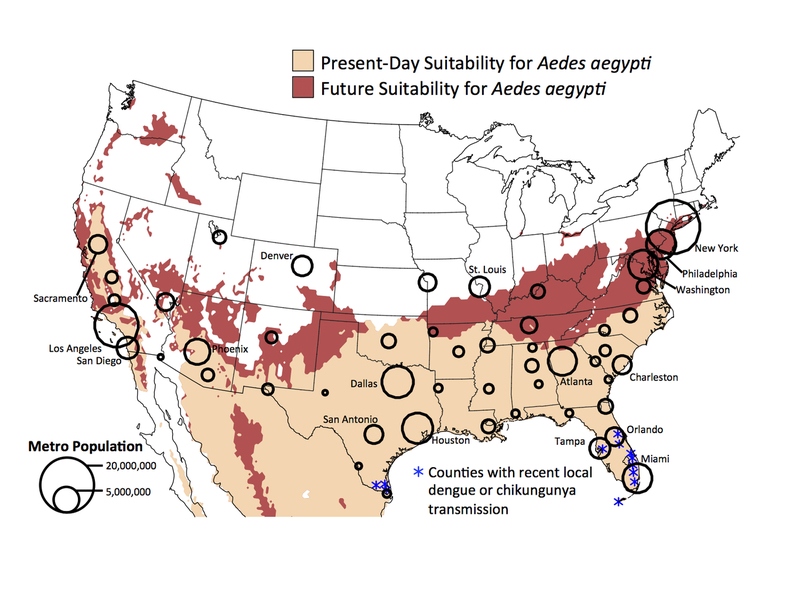 We found that both climate change and human population change will play a part in driving future human exposure to Aedes aegypti globally. In the United States, specifically, warming temperatures from climate change mean that this disease-spreading mosquito will be increasingly abundant in the southern and eastern U.S. These models were derived from two plausible future scenarios for air pollution and greenhouse gas pathways in the 21st century: one in which greenhouse gases are mitigated so that global average warming doesn’t exceed 2 degrees Celsius average temperature increase over preindustrial levels and another in which greenhouse gas emissions continue to grow unchecked. Finally, we examined population growth for two different possible future socioeconomic conditions. The “low vulnerability” scenario assumes improved living standards and falling birthrates in poorer countries, and another “high vulnerability” scenario has continued low living standards and high birthrates in poorer countries. As always, the devil is in the details. For example, our analysis found wealthier regions that are the margins of the present-day range for Aedes aegypti – Australia, North America and Europe – would benefit the most from reducing greenhouse gases. Minimizing warming means changes to the mosquitoes’ range will also be minimized at these cool margins.